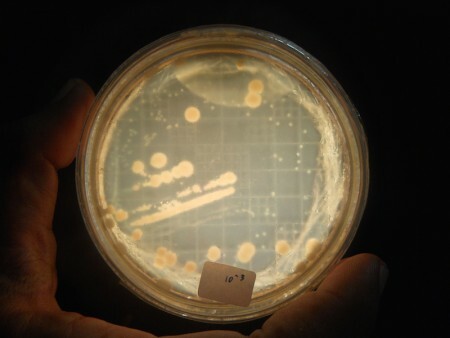 Research on finding Saccharomyces Cerevisiae from indigenous fruits of Indonesia. The yeasts then examined its ability also characteristic. Preferebly on acid resistance and ethanol tolerant. Yeast with higher acid resistance and higher ethanol tolerant is uncommon from any traditional winemaking. The goal is to seek another possibilities on winemaking and fermentation technique in general and contribute to the diversity of bio-engineering worldwide. In the process of isolation, there is a stage called Streak Plating. Streak Plating is a technique for separating / transfer one species into the agar medium. The colony will be formed between 24 to 36 hours. The process then examined with spectrometer to analyze the growth of the colony. The growth of colony will also determined the change of the sounds periodically, it becomes a time-based sound instrument and scientific instrument in the same time. INFLUX, Galeri Cipta II, Jakarta, 2011.